Steve Wallen Swim School is excited to announce that we will be having our Grand Opening Celebration for our new swim school in Roseville this upcoming weekend! It will take place on Sunday, October 14th, and be held from 1:30 p.m. to 4:30 p.m.
Come on by and join us for a fun-filled day to celebrate the expansion of our swim program at our exciting new location! For this event, we will be providing FREE food, drinks, face painting, balloon art, and a bounce house. We will also be hosting a floating pumpkin patch to get everyone into the spirit for the Fall season. Our goal for this event is to round up as many kids and families from the Rocklin, Roseville, Lincoln, and Granite Bay community as possible and show off our new indoor swim school facility. Additionally, we would love to include our customers who have continued to come and support us year after year from our El Dorado Hills location, which has been open for 11 years as of January 2019. 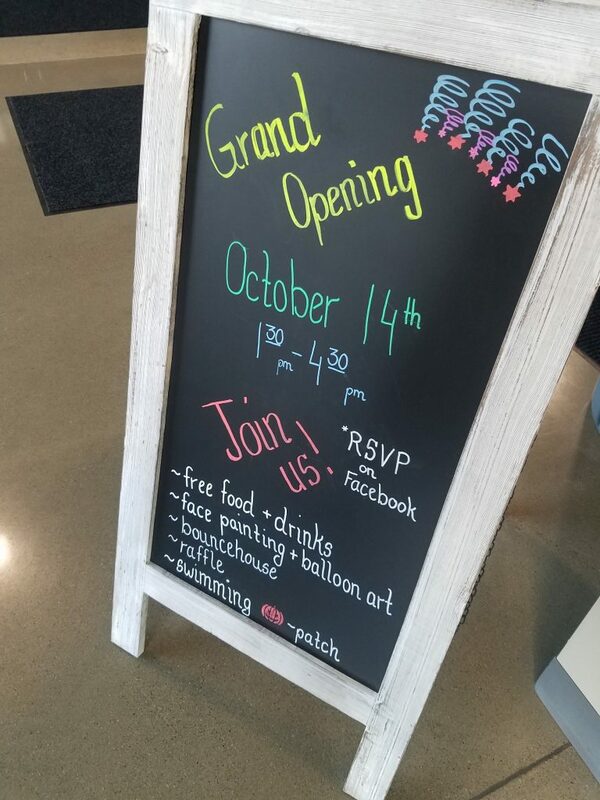 Leading up to our Grand Opening Celebration, the Roseville Chamber of Commerce will hold our Ribbon Cutting Ceremony on Thursday, October 11th at 4:00 p.m. to officially open our doors. All are welcome. We encourage all first-time students to sign up for a Free Trial Class online, at www.wallenswim.com/free-trial-class. These classes consist of a 30 minute semi-private lesson. Steve Wallen Swim School is proud to have recruited such a personable and friendly new crew of instructors. We can’t wait for you to meet them! Steve Wallen Swim School offers parent-tot, private, semi-private, and group swimming lessons for swimmers in Roseville, Rocklin, Loomis, Lincoln, Granite Bay, Sacramento, and surrounding Placer and Sacramento County areas. Our programs are designed for baby swimming lessons, kids swimming lessons, and adult swimming lessons for all skill levels. From beginner swimming lessons to competitive swimming lessons, our experience allows us to tailor our program to meet your specific need. Contact us today to schedule a tour of our new facility or to enroll. You’ll be glad you did! This entry was posted in Roseville. Bookmark the permalink.